As mentioned in our previous log, we created a completely new Activity view. There were some minor issues that we now fixed. We also made a progress on our mobile apps (iOS and Android). [FIXED] When multiple filters were used, downloaded documents presented incorrect data. [IMPROVEMENT] Better visibility of "active" filters. [FIXED] Incorrect decimal format in some cases. [FIXED] Multiple time logs were tracked via mobile apps. [IMPROVEMENT] Improved visibility of date selector in mobile apps. [FIXED] Project selector overflowed other elements. There might still be some bugs running loose. Please let us know if you cross paths with any of them by chance. We've been working hard on My Hours Activity report for the past 3 month and we're proud to finally release it to our customers. 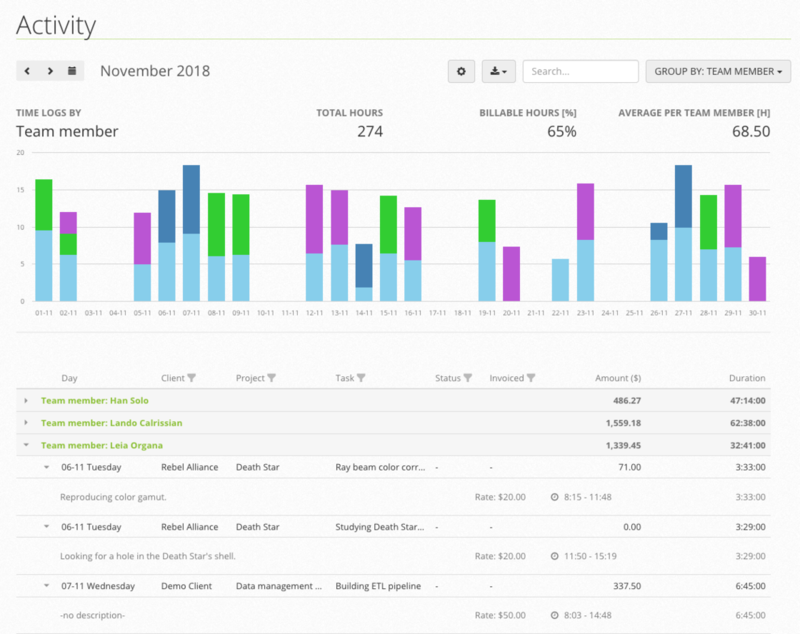 But the biggest change is the addition of Activity chart at the top of the Activity report. We hope it will empower you, our customer, to find helpful insights even faster. which days have missing entries? which tasks take more time than others? is our billable time increasing over time? Let us know if you have any questions or feedback in general by emailing us. We realize that you might have existing time logs inside spreadsheets. Either you entered them manually over time or you exported them from some other tool. My Hours now enables you to upload these timesheets and get all the data you need inside the application. This way, all your time history will be in one place and enable you to use our advanced reporting functionality. Contact us if you need help with importing. From this day forward, you can request a Preview of the new Activity report that includes all these functionalities. Just send us an email to [email protected] and we'll enable it. In the coming weeks we'll add brand new charts to the report and ability to save and schedule selected reports. We've made significant changes to the way My Hours collects and displays Projects and Tasks in the Tracker dropdowns. Now, selecting Projects and Tasks will be faster than ever. Keep in mind, though, if you are assigned to 1000s of Projects it might still take a while to display them. We suggest to archive unused projects or unassign members that do not need them. We've recently released a new version that includes a completely new way to change billing rates for past time logs. One thing that we've heard over and over is how hard is to update rates on the time logs that already had a legacy rate applied. Below is a quick explanation of all the changes and how they work. For more info, please visit our help center. 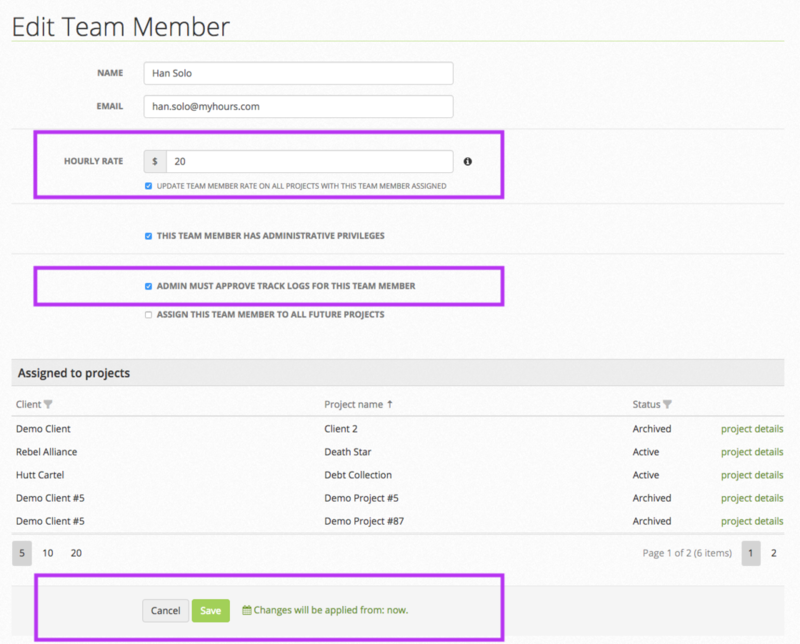 Project billing rates and approval: Whenever you change billing method, billing rate or approval settings, you can apply these changes to existing time logs by clicking on the link beside Save button. This is nothing new. What is new is that even if make no changes, you can simply click a link "Changes will be applied...", change the date in the popup and your project setting will apply to existing time logs. Team member and task billing rates and approval: Up until now, it was almost impossible to update a team member's rate on existing time logs. You can now, just like on Projects, simply update billing rate with a click on a link at the bottom of the page. We realize we might confuse some with this new system. Please write us an email to [email protected] with any questions or suggestions. Administrators can now enable an email notification when a budget threshold is met. We're removing the Budget report view, since budget information is now available on the Projects page. 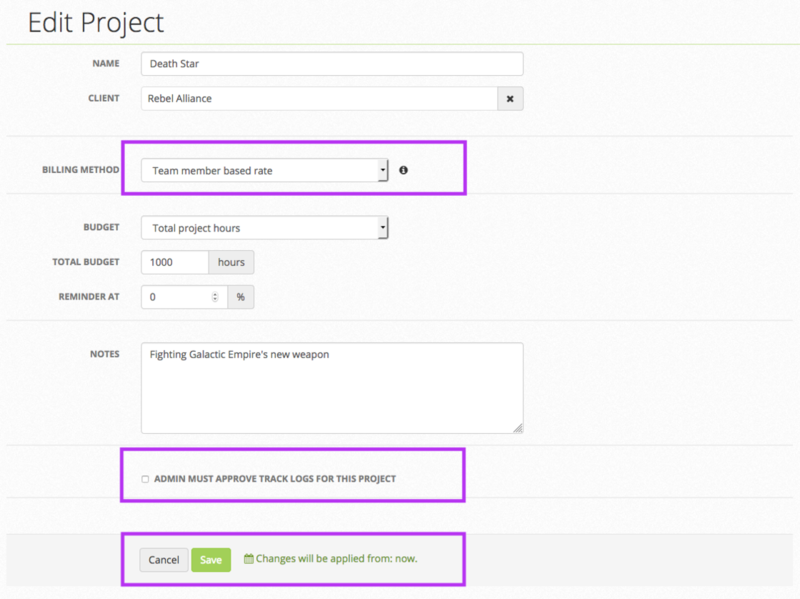 The Budget link will remain inside navigation dropdown for a while, but will redirect you to Projects page. You can now make a copy of an existing Project. 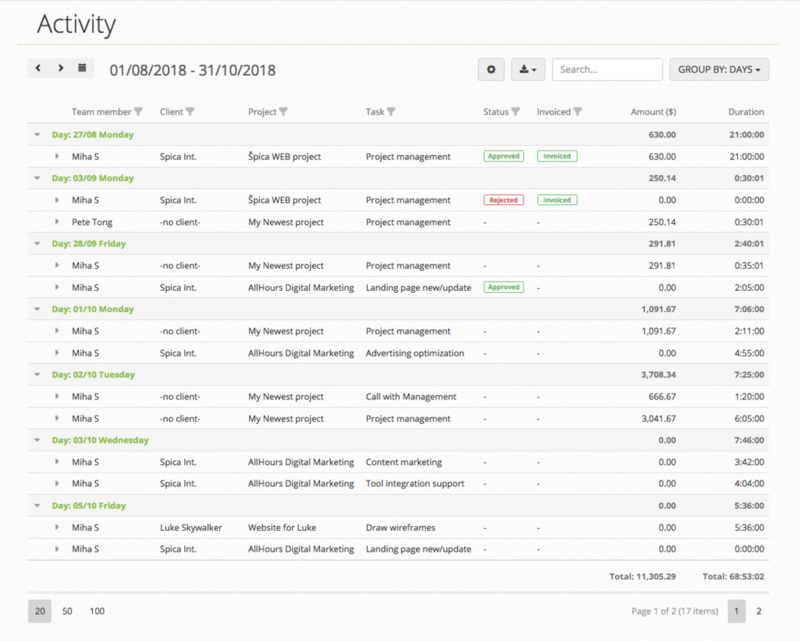 This functionality is great for those that have many similar Projects, as you can create a new Project with the same Client, Tasks and Team members already assigned to it. We're starting a public changelog so you're always up to date with all the updates, improvements and fixes that are made in My Hours. Even though we work on My Hours all the time, sometimes it may seem that not much is happening. This changelog is here to improve that very important part of the communication between you and us. Surely My Hours will start publishing changelogs very soon.